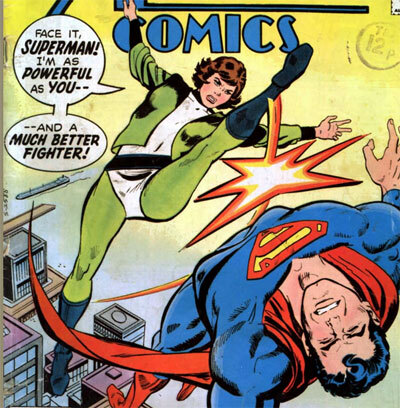 Dev Em was a Kryptonian juvenile delinquent who happened to escape the destruction of Krypton and ends up on Earth. 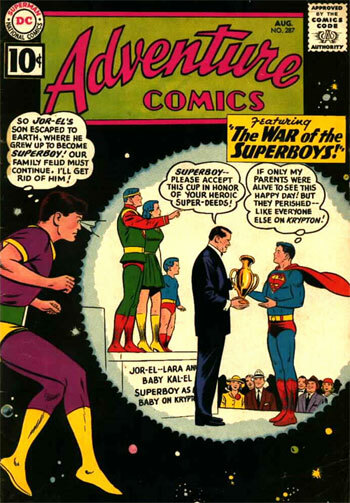 While he begins his story as a foe of Superboy, he would later reform and join the Legion of Superheroes showing up from time to time in those stories. I first saw him when he showed up in the Great Darkness Saga. Created by Lex Luthor from collected pieces of galactic matter to destroy Superman. After its first battle with Superman (wherein Luthor helps to dispatch the creature) it shows up again a few issues later and really lays the smack down on Superman. 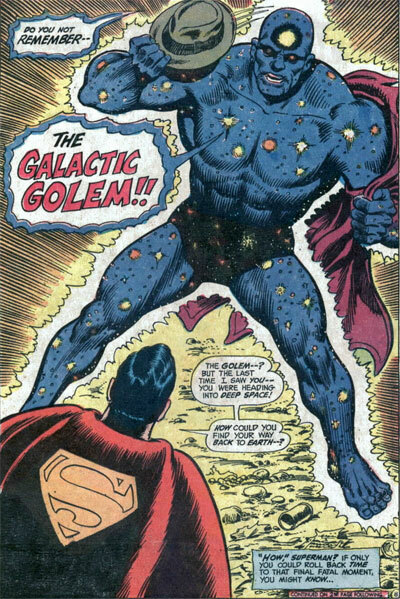 The internet suggests the golem made an appearance in JLA vs Avengers mini-series. While I don't remember that, I can totally see Kurt Busiek adding the golem to the story. Inspired by the Sean Connery movie Zardoz, Vartox was the Hyper-Powered hero on the planet Valeron who comes to Earth seeking justice for the death of his wife. 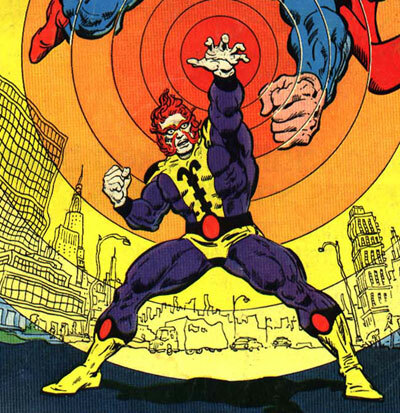 While his vendetta initially puts him at odds with Superman, Vartox would return several times later in the series as an ally. An alien from the Andromeda galaxy, Karb had to leave his home planet due to having an allergy to everyone on his home world. 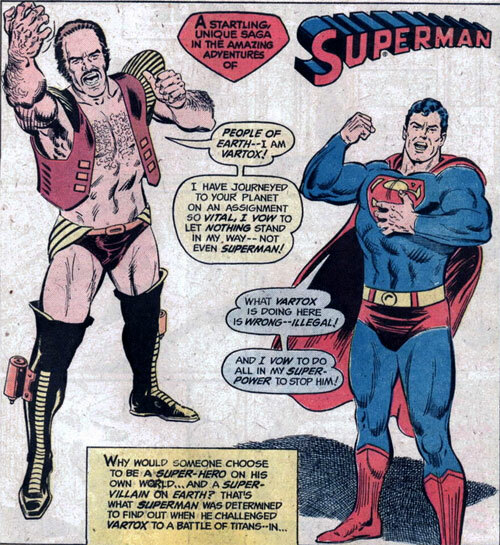 Unfortunately, Superman's Kryptonian biology is enough to cause Karb's allergy to flair up which results in a battle between the two of them which ran its course through 4 issues. Karb-Brak was eventually cured by Vartox. 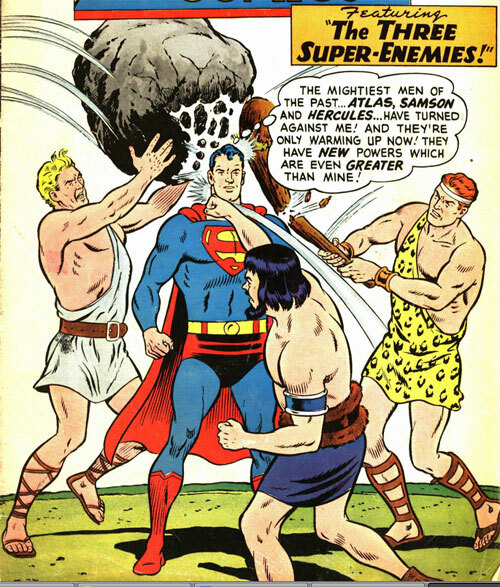 A common story idea in the Silver Age was to have Superman face off against some strong man from history. Grant Morrison pays homage to this conceit by having Hercules and Atlas show up in All-Star Superman. Of these three, Hercules seems to have had the most appearances. Faora's background suggests there is more to her story than is revealed in her Bronze Age appearances. A Kryptonian sentenced to the Phantom Zone for the crime of killing 23 men at a secret concentration camp, She is also a master of the Kryptonian martial art of Horo-Kanu. In her first battle against Superman, she has the ability to use mental lightning, but doesn't have this power in later battles. Created by Len Wein and Jim Starlin, Mongul is an interplanetary space tyrant with devastating powers and abilities. In their first confrontation, Superman ignores the advice of the Martian Manhunter to not face Mongul alone, and gets soundly defeated as a result. 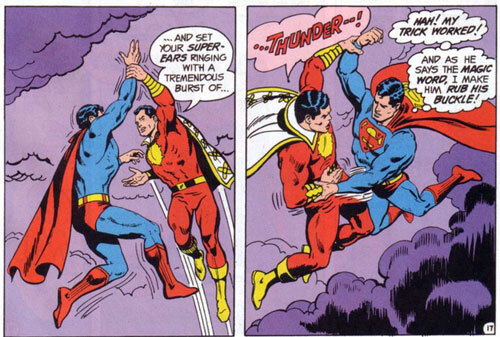 Powers: Advanced Tactile-telekinesis that provided flight, invulnerability, and superhuman strength. Superhuman hearing and heat vision. A space saboteur on a secret mission to destroy Krypton, Black Zero discovers that Jor-El's prediction of destruction was wrong because the internal pressures in the planet had subsided. 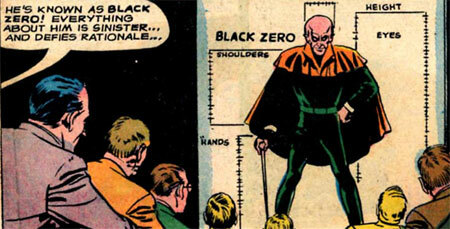 To this end, Black Zero causes the pressures to build back up causing the destruction of Krypton. 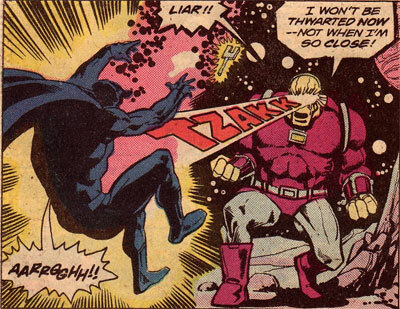 Later, Black Zero comes to Earth where he faces off against Superman. This character would return in name only in Post Crisis continuity. Little known fact: Twomorrows Publishing's Back Issue #30 revealed that another Bronze Age appearance which was drawn but never published. Powers: Magically tougher than Superman and has a 9 foot Katanna. Appearing at the end of the classic Sand Superman Saga , an entity from Quarrm possesses a statue of an Oriental War Demon in Chinatown and proceeds to beat Superman up so badly he has to recover in a hospital. While this creature never returns after his initial appearance, his size, alien appearance and distinctive battle armor have always made him a personal favorite. So, that's my Top Ten. Is there a favorite Superman foe you would add to the list? Last week, DC revealed a new wave of cancellations (many of which would be no surprise to regular readers of this blog) including long time fan favorite, the Legion of Superheroes. 1. Has the Losh really been continuously published for the past 40 years? Wasn't there a period several years ago when they were just a seldom seen backup in a short lived Adventure Comics in 2009? Seeing how this latest version was Volume 7 of a title that has been rebooted 3 times, I think it's a bit rediculous to call it continuous publication. 2. Does anyone really think this will be the last we see of the Legion in a comic? In a world where Grant Morrison can put juice back in the Batman of Zurr-en-arrh, I would be relunctant to count the Losh out for long. 3. Is the Legion a concept that can't be retooled for this era? 4. Why don't younger fans like the Legion? 5. What is my favorite era of the Legion? That's a tough one, because I like different eras for different reasons. Currently, I would say the Silver Age, mostly for the background ideas that appear in the stories - like a desk unit that has yes/no light displays on the front. I would love one of those for work. How would you make the Legion a successful comic in this day and age? Why Do People Quit Reading Comics? 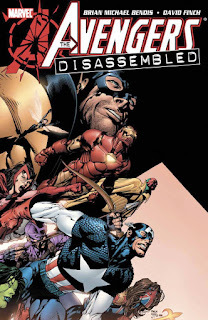 On many occasions, I've written a post about the rather lackluster state of comics from the big two and invariably, the post will generate comments from people saying they've completely given up on comics "...ever since they cut off the Joker's face, or Avenger's Disassembled or DC 52, or..." you get the idea. I totally sympathize with the frustration people might feel about the lack of quality coming from Marvel and DC (though the actual change in quality might not be as huge as you think it is, all things considered.) What I don't understand, is how this leads people to just give up completely on the genre itself. People don't quite watching television shows because they didn't like how LOST ended. So why is it that so many people quit comics altogether because Doctor Octopus is now Superior Spider-Man? I suspect the answer is that a large part of the readership isn't really that enthralled with the genre in of itself. That's why independent titles languish, but umpteen Batman titles reign supreme. It's not the genre that people like, but the idea that Batman and his universe is something they are partaking in. The problem with that comes when writers do something with Batman that no longer fits with how you perceive his universe. Then you are left with nothing. 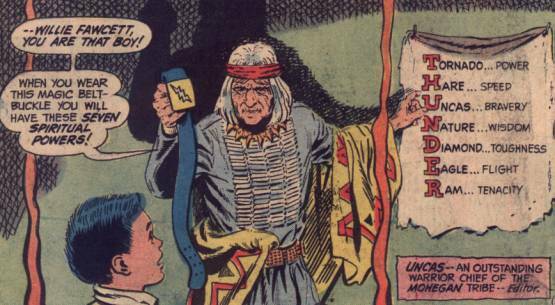 Which is sad, because in many ways, we are currently in a new Golden Age of independent comics. I would definitely encourage anyone who has "Given up on Comics!" to try some new independent comics. You might find yourself really enjoying the experience of discovery all over again! I had planned to go see Iron Man 3 yesterday, but due to circumstance beyond my control, I found myself casting about for cheap ways to keep my daughter and her friend entertained all day. My solution: take them to Free Comic Book Day! As it turns out, that was the right choice as they both got a lot of free comics and were enthralled with the guest artists drawing sketches at the event. Check out our friend Sean McGuiness as he accepts the dubious challenge of drawing a Rainbow Godzilla. We actually ended up making two trips to the event (it was either that or go to Build-A-Bear which is sort of like the antithesis of Free Comic Book Day) and during both visits, I was impressed with how many kids were in attendance. Also impressive was how well the shop seemed to be doing on back issues and graphic novels. There was always a line at the register with people waiting to buy stuff. As for Iron Man 3, from what I hear, it will be in the theaters for a while, so I'm sure I'll get to it eventually.